Ensuring quality care, combatting opioid addiction, and optimizing support for behavioral health were several critical topics of discussion during a forum convened at the Association of the U.S. Army Annual Meeting and Exposition that focused on military families. “Our service members make up the team that protects our freedom around the world,” said Lt. Gen. Nadja Y. 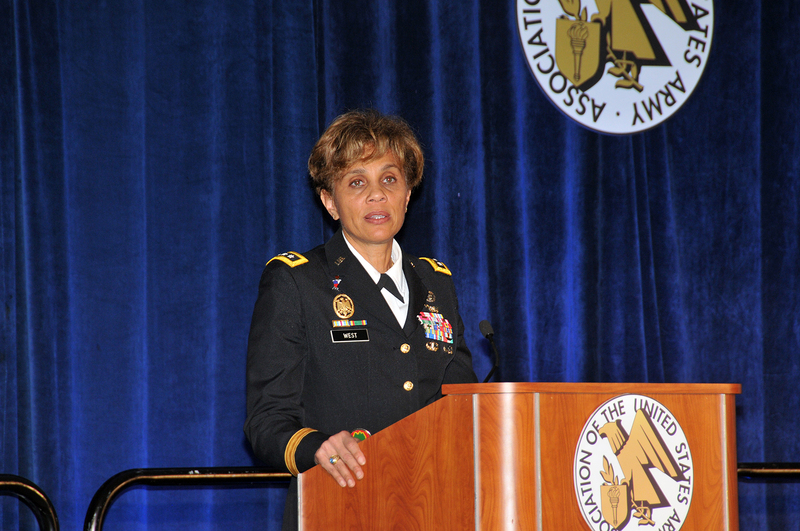 West, Army surgeon general and the commanding general of U.S. Army Medical Command. “Army medicine’s uncompromising commitment to quality of care and patient safety is essential to make sure we maintain the medical and health readiness of our total Army, but it is also vital to the health of our families,” West said. She said the Army measures medical outcomes against national benchmarks administered by the National Committee for Quality Assurance, the governing body that evaluates and assesses all healthcare facilities in the U.S.
West said 100 percent of all Army medical facilities are joint-commission accredited, and meet NCQA’s standards of quality, safety, and standardization of care. In addition to the joint accreditation, Army medicine works to meet the surgical standards of quality set by the American College of Surgeon’s National Surgical Quality Improvement Program. Approximately 13 percent of the best hospitals in the U.S. participate in the program, West said, while 100 percent of Army hospitals participate. “Not only do we compare favorably, but recently the team at Brooke Army Medical Center [in Fort Sam Houston, Texas,] received a meritorious achievement award from the American College of Surgeons,” she said. To help determine the effectiveness of behavioral health programs, a quantifiable survey has been established to help track and improve the Army’s health system. “Historically, measurement-based care has not existed on this scale,” West said. “This is an Army-developed system that represents a novel, real-time standardized approach to demonstrate an individual and population health improvement from the enterprise level to the military treatment facility provider.” West said the effort is a “great tool” to better understand if individuals are getting better based upon the interventions that are made. Currently, soldiers and family members can receive behavioral health services through their primary care managers or an outpatient medical facility. But West said that Army medicine is looking to expand its capabilities through the employment of telephone consultations and virtual health platforms. Additionally, she also acknowledged the mental health needs of Army families, as 58 percent of all soldiers are married, and 47 percent of the force has children. It is not just soldiers that need behavioral health care. “Our children are required to move and change schools and make new friends,” West said. And sometimes, she said, those children are making those life changes when one or both of their parents are deployed. To help, Army medicine is testing an in-school behavioral health treatment program to improve ease-of-access to students in need of support. Military spouses may also need behavioral healthcare support, West said, due to their own unique challenges. Communities across the nation have in recent years been struggling with an increase in opioid addiction. The Army community is not immune to that crisis, West said. Opioid use peaked in the Army in 2012, according to West. Since then, the Army made a concerted effort to address the issue by decreasing the total percentage of soldiers given one or more opioid prescriptions over a 180 day period. In 2010, the Army created a pain management task force, which garnered 109 pain management recommendations. Those recommendations helped build an array of best practices for the care of acute and chronic pain, based on the best evidence available; provided tools and infrastructure that supports encouraged practice and research advancement in pain management; and synchronized a culture of pain awareness, education and proactive intervention, according to the general. West said she knows more can be done. “We’re not going to be happy until we can get this down as close to zero as we can,” West said. “Army Wellness Centers are ‘performance triad’ platforms that focus on sleep, activity, and nutrition,” West said. The goal is to create a more proactive approach to a person’s health and wellness. This starts by addressing harmful lifestyle behaviors. In turn, wellness center professionals can provide individuals with the tools they will need to make positive changes over time, she said. Wellness centers and primary care managers work in tandem by implementing a coordinated approach to patient care, West said. This ensures a proper alignment of treatment for all patients and continuously provides patient progress and oversight. Additionally, in December 2016, West directed sweeping changes to Army medicine policies related to access to military treatment. “As a result of the hard work, patients at Army military treatment facilities can make appointments six months out,” she said. These changes created an additional 680,000 primary care appointments and increased acute appointment availability by 37 percent.